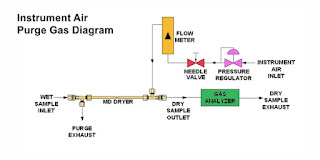 Sample gas used for analysis in process control operations will often need some conditioning in order to accommodate the input needs of the analyzer. A common requirement is to maintain a certain moisture content in the gas sample, requiring either addition or removal of moisture from the sample stream. It is advantageous, even necessary, that any conditioning done to the sample gas have no impact on the component(s) subject to analysis. One technology provides for specific removal or addition of moisture (water) in a simple fashion, with no impact on other sample constituents. 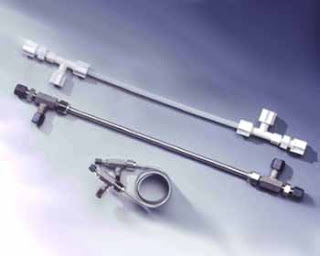 Perma Pure gas sample dryers and humidifiers use Nafion® tubing, with a selectively permeable membrane that permits only the passage of water molecules. By controlling relative vapor pressure around the exterior of the tube, moisture can be drawn from, or added to, the sample gas stream. The simple device employs no moving parts and the vapor pressure differential is easily achieved using shop instrument air or other sources readily available. 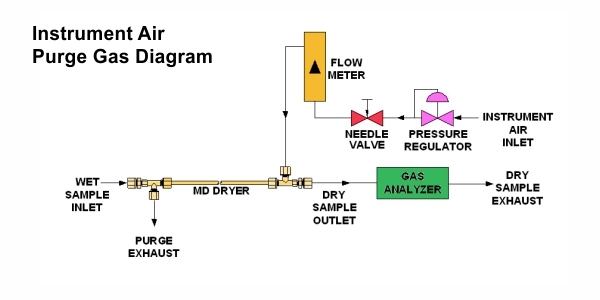 Share your gas analysis challenges and requirements with product application experts, combining your process knowledge with their product expertise to develop effective solutions.